around me a metal and cardboard cage. our unassuming blue water tower. the relocating of signs about town. a friend’s corner yard–three signs here. like a squared puzzle, a child’s game. you are so proud now, unlacing your shoes. and we are not friends, just upside down lovers. our knees quietly kiss goodnight under covers. unconsciously reaching around my stomach. So simply our bodies are realigned. to tell me why it holds us head to head. Fifteen years a Hungarian baby. flowing night gowns floating out my bedroom door. Fifteen year Hungarian beauty queen. of rich men but deflected them from my gold. in a house kept by that aging woman. Fifteen years I drank filtered champagne. Then you grabbed my gold and made me greedy. doll houses and diamonds than you promised. limply for life times under loosened sheets. for a man to recreate that night. 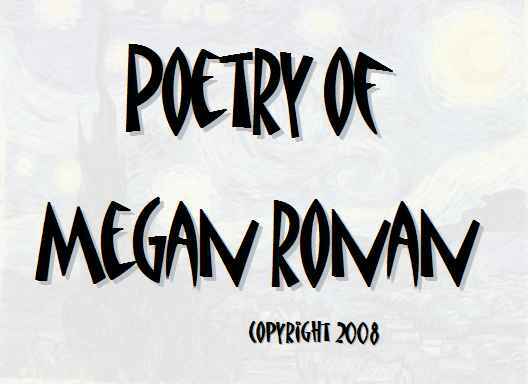 Copyright 2008, Megan Ronan. © This work is protected under the U.S. copyright laws. It may not be reproduced, reprinted, reused, or altered without the expressed written permission of the author. Megan Ronan is pursuing an MFA in poetry at George Mason University and is the poetry editor of So to Speak: A feminist journal of language and art. Her work has recently appeared or is forthcoming in Peeks and Valleys: A Southern Journal and The Shenandoah Review.